Fulham's fanfare accompanying the appointment of Claudio Ranieri after Slavisa Jokanovic was sacked in November labelled the Italian as "risk free and ready made for the Premier League". Those words were thrown back in the face of Fulham's owners via a banner brandished during the 2-0 loss at Southampton that ended Ranieri's calamitous 106-day reign at Craven Cottage. And they are made to look almost farcical given Ranieri's dismal record of three wins from 17 games as Fulham now looked doomed to relegation, standing 10 points from Premier League safety with only 10 games left. How, then, did it all go wrong for Claudio Ranieri? Fulham were banking on Ranieri repeating his spectacular feats at Leicester City, where he and his team captured the imagination of the world to pull off arguably the biggest shock in the history of British sport by winning the Premier League in 2015-16. Owner Shahid Khan glossed over the subsequent instant collapse at the Foxes which led to his sacking just nine months later, all momentum lost and the previous season's triumph looking like the sporting equivalent of lightning striking several times. Ranieri's Fulham reign started with a win at home to Southampton but it was a fortunate three points and his lack of impact on any part of Fulham's team meant they were left sleepwalking back into the Championship after an ambitious £100m spending spree last summer. He was meant to make Fulham harder to beat, more pragmatic and steely than under Jokanovic's expansive guidance. Instead, Fulham have got worse. Jokanovic's team were criticised for defensive weakness, but in 12 games they conceded 31 goals while Ranieri's have conceded 32 in 16 - despite organisation and defensive parsimony being one of the Italian's selling points. The football has been dull while Ranieri appears to have mislaid his blueprint for defensive organisation. He also suffered from a lack of discipline and direction, notably when Aboubakar Kamara had a training ground row with striker Aleksandar Mitrovic not long after insisting he should take a penalty - and not the Serb - against Huddersfield Town. Kamara missed the penalty, infuriating Ranieri, but the incident was almost symptomatic of the way Fulham's season was disintegrating. 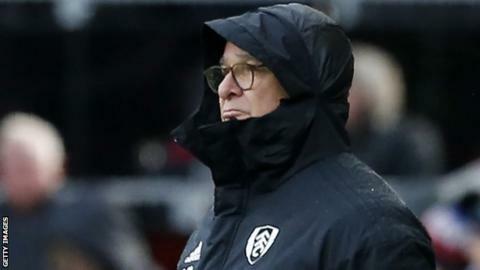 Ranieri has always been a popular character and criticism never comes easy from Fulham fans who were desperate to see flashes of his old qualities, but performances and his failure to correct them saw patience snap, as witnessed with the anger of the travelling support at Southampton. Only six managers have had shorter Premier League tenures than Ranieri and it has been sad to see the fire drawn from his personality in what has been a tortuous time at Craven Cottage. The "risk free and ready made" Premier League manager Fulham insisted they were getting when he was awarded a "multi-year" contract was a thing of the past. If there is the smallest consolation, it is that they have at least put Ranieri out of his misery before what now looks like an inevitable relegation. It was an appointment made with romantic visions of Leicester City. In the end, it resembled a loveless, arranged marriage which both sides appeared happy to end, with Ranieri hardly a picture of defiance post-match at St Mary's. Fulham have found, to the likely cost of a drop back into the second tier, that the sort of romance we saw at King Power Stadium is once-in-a-lifetime stuff. "Risk free and ready made" has turned out to be fatally flawed and unfit for purpose with a manager who only had one miracle in him. This was real life for Fulham and Ranieri and it has turned out to be a dreadful appointment. Can you name the Premier League managers with the 10 shortest reigns? Ranieri was the manager taking Fulham towards the precipice - but make no mistake they were already on hazardous journey before he arrived. He has rightly paid the price for an ineffective, listless performance as manager but the signs were there when he arrived back in London, succeeding Jokanovic after Fulham garnered only five points from their first 12 leagues games. It was bad. And while it arguably got worse under Ranieri, this was a relegation in the making before his brief and inglorious time in charge. Fulham returned to the top flight hailed as an attractive addition given their easy-on-the eye and potent style that saw them win a Wembley play-off against Aston Villa. It soon became clear that what passed as progressive in the Championship was a recipe for trouble in the Premier League as Fulham were picked off by the more astute teams and players at the higher level. And while the £100m spent on a variety of players was hailed as a statement of ambitious intent, in reality it was a scattergun policy lacking in structure and strategy that was evidence of a poor recruitment structure behind the scenes. Aleksandar Mitrovic's £20m signing from Newcastle United after a loan has been good business but other big-money buys such as defender Alfie Mawson, signed from Swansea City for £20m, Jean Michael Seri - who cost £25m from Nice - and £22.3m midfielder from Marseille, Andre-Frank Zambo Aguissa, have not stopped the slide. Ranieri has picked up those pieces and when this desperate season is put under the microscope, it is not simply his contribution that must come under scrutiny. What now for Ranieri and Fulham? Ranieri lives for football management but, as one of the elder statesmen with another sacking on his record, it is hard to see him now getting the sort of high-profile job he would crave. It has been suggested by some he should have quit on an incredible high at Leicester City, but football men are not wired like that. Ranieri has looked a shadow of his former self this season; a lost and beaten man for some time. He and so many others will have warm memories of that glorious 2015-16 campaign - but his time at the top and in the Premier League is surely over. As for Fulham and Ranieri's interim replacement Scott Parker, they must somehow try to fashion an unlikely miracle against all the odds and evidence. Ranieri's career since winning the title at Leicester City proves they do not come along too often. Parker, highly regarded as a coach, can at least enter the job with a clear head. No-one will blame him should the worst come to pass. He must somehow glue together a disjointed squad lacking in confidence and low in morale, starting at home to Chelsea on Sunday. Chelsea have proved they can be vulnerable on the road but Parker must unlock something that has been well hidden for months. The key is playing to Mitrovic's goalscoring strengths while finding a way to keep a clean sheet. If he can somehow ensure Fulham survive, or at least show signs of life, he might yet come into owner Khan's thinking as Ranieri's successor.